Modern-day architects marvel at how their 6th century counterparts could design the immense Hagia Sophia and its "impossibly" high-and-wide domed ceiling. The structure was built by the Christian Emperor Justinian I as a Byzantine church. It served as a Byzantine church for the next 900 years. The Islamic-faithed Ottomans took over Constantinople (now Istanbul). They wasted little time in converting the Hagia Sophia into a mosque. It served the Muslims for almost 500 years. During this time, the Ottomans painted over the Christian mosaics - and erected the four defining minarets we see today. 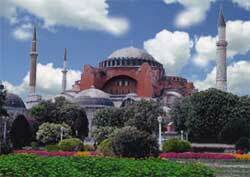 Turkey changed the Hagia Sophia's status from mosque to museum and uncovered the priceless Byzantine mosaics.